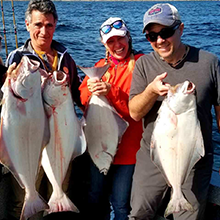 Hunting for Halibut: This halibut fishing trip is geared towards the more focused fishermen who wish to spend their entire day hunting for halibut. Although our focus is to catch halibut, bottom fish such as rockfish, lingcod, and pacific cod are commonly caught where we fish for halibut. This six-hour fishing trip allows for 4 to 5 hours of fishing time pursuing Halibut. The amount of fishing time depends on how far we need to run to reach ideal halibut grounds. Our Hunting for Halibut trips take place in our 24 ft. Cabin Cruiser vessels which can accommodate a maximum of 6 passengers and fish with an average of four or five.